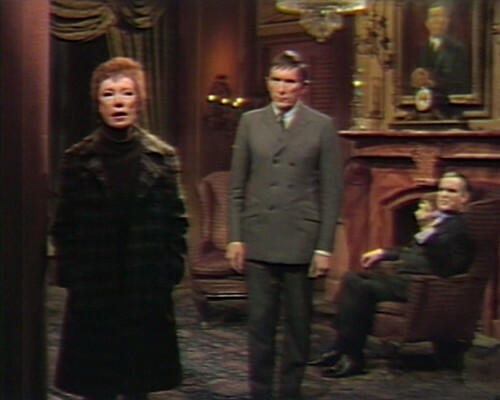 Barnabas Collins is standing around helplessly in the Old House drawing room, constitutionally unable to take a step that will advance the storyline in any meaningful way. Then there’s a knock at the door, and who should walk in but Leona Eltridge and a Large Teen Idol. As house guests, these two make a challenging couple. Adam is a violent, impatient Frankenstein monster who wants Barnabas to create a made-to-order Bride for him, and she’s the temporarily embodied spirit of an 18th century French guillotine enthusiast named Danielle Roget. Danielle is trying to keep her true identity a secret, so she’s adopted an anagram, “Leona Eltridge”, as her pseudonym. 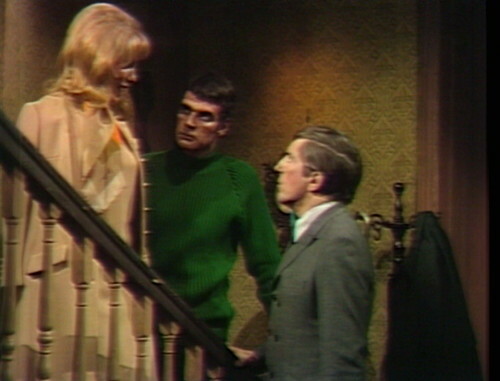 That’s not the silliest thing that Dark Shadows has ever done, but it’s damn close. She’s terrible, by the way. People make fun of soap opera actors, but it’s not until you see a truly terrible actor on the show that you realize how incredibly skilled the regular cast actually is. Leona has clearly been trained in enunciation — she pronounces each word as if it were hewn from the living rock — and she completes every line by allowing her face to fall back into its default resting position. The conversation is a bit strained. Barnabas: I don’t know who this lady is, or where she comes from, and I want to know. Leona: I told you who I am. My name is Leona Eltridge. Barnabas: Adam has told you about this experiment? Barnabas: And you’re willing to participate in it? Leona: For a variety of reasons. All of them, I think, quite valid. Barnabas: Where did you come from? Where did you and Adam meet? Leona: It’s a long story, and I’m very tired. Yeah, no kidding. This has been a rough storyline, and watching this episode in particular makes me feel like I’m at the bottom of the Mariana Trench, with six miles of ocean pressing down on my head. I feel that way for a variety of reasons, all of them quite valid. For one thing, they’re building up to their third straight attempt to bring Adam’s bride to life, which was thrilling the first time but has now become a chore. You’d think that by now they’d have the protocol pretty much figured out, and they could get right to work, but this is Friday, and they want the Bride coming to life in the last three seconds so that viewers will have to come back on Monday to see what she’s like. That means there’s a solid 21 and a half minutes of padding between us and the only thing that actually happens all day. Julia brings back reinforcements, in the person of Professor Stokes, so they have more people to stand around and recap to. 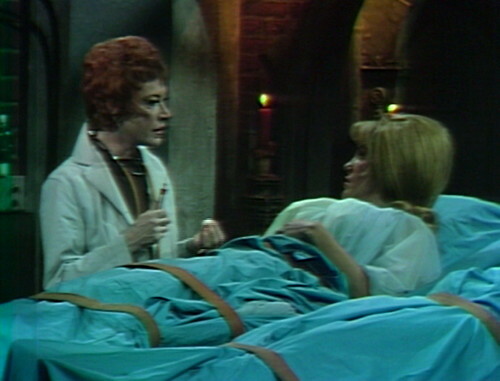 First, Barnabas tells them that Carolyn is alive, which Julia seems to find upsetting for some reason. Then they dive into more recent developments. Barnabas: Just a few minutes ago, he came back with this girl, the girl that’s upstairs now. Stokes: What did she say her name was? Julia: And that’s all she told you about herself. Barnabas: Yes. She wouldn’t answer any more questions. There’s no logical explanation for anything that’s happened tonight. This may qualify as a new low for Dark Shadows recaps: Barnabas is describing a conversation that we saw three minutes ago. There hasn’t even been a commercial break yet. At a certain point, we’re going to reach the stage where people are recapping while the scene that they’re describing is still going on. Adam comes downstairs and says that they should begin the experiment now. Julia says that they can’t, because it’ll take a little while to set up the equipment. This is not an acceptable position to take. Julia has spent the last several weeks setting up the lab equipment — twiddling knobs, adjusting switches, frowning and tapping — and there doesn’t seem to be any way to get her to stop. Now, you’d expect that to be a fairly exciting if oddly-phrased threat, but on Tuesday, Adam ran out of the house, claiming that he was about to kill everyone at Collinwood. The next day, Willie came in and said that he’d just passed Adam in the woods, sitting under a tree. These people have got to start following through on their holocausts. Professor Stokes comes upstairs, and asks Leona to explain why she’s volunteering to be the life force in the experiment, even though she may die. She gives him an explanation which I will not bother to repeat, because I value your time. Instead, let’s head down to the laboratory for another minute of Julia flipping switches and tapping on things. Barnabas comes downstairs, and she says that she’s ready to start. 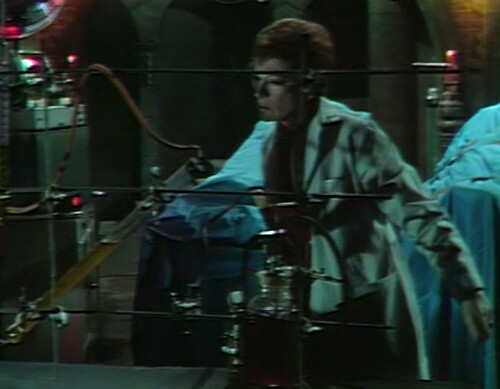 “Then we can begin the experiment,” Barnabas says. And then they break for a commercial. Seriously, I can’t deal with this anymore. Even the characters are getting fed up by now. At one point, Adam says, “Julia, you’re wasting time,” and Barnabas sighs, “All right, let’s get this thing done.” I don’t think that’s a very common attitude in Frankenstein movies. Julia goes through her pre-flight checklist, and then they do cross-check and all-call. The flag goes up, and it’s time to pull the big switch and infuse the patient with some vintage élan vital. Running through the experiment this time, they actually use fewer lighting effects and weird camera angles than the last two times, because honestly every single person involved is sick of it. Finally, they switch off all the machines, and Barnabas and Julia immediately launch into their well-rehearsed excuses for why they failed this time. But then the Bride moans, and starts to move. They unwrap the bandages from around her head, and Adam shouts, “She’s alive! She is alive!” because I guess somebody has to. One of the cameras has broken again, and there’s a bright green stripe down the left side of the picture. This happened about six weeks ago, and it took them two weeks to fix it. Leona’s has a different hairstyle than she had at the end of yesterday’s episode. 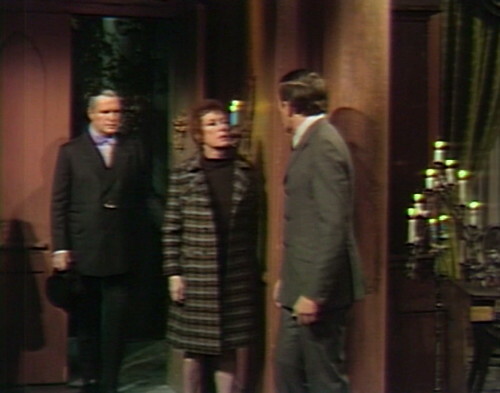 As Adam leads Leona to the stairs, he bumps into Barnabas’ cane, which is hanging on the coatrack. The cane rocks back and forth in a distracting way for the rest of the scene. The camera pulls in on Leona as she’s lying on the bed, but it begins to shake. There’s a quick cut to another camera, shooting her from a similar angle. At the end of the episode, Eve moans as she comes to life. 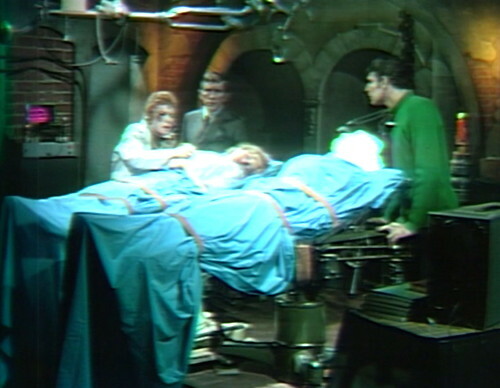 When Barnabas rushes to her side, a boom mic can briefly be spotted overhead. 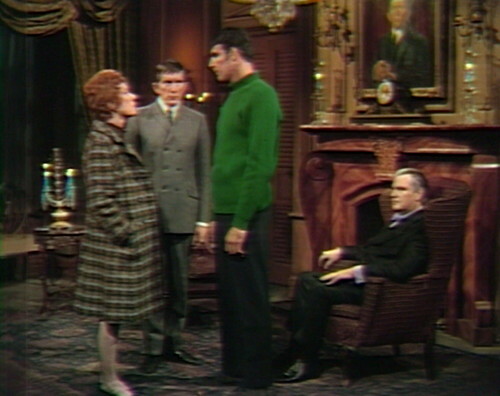 Erica Fitz is, I think, the worst actor to appear on DARK SHADOWS. She edges out Addison Powell because at least there was some entertainment value in his performance that was appropriate for a mad scientist in a B film. Fitz reads her lines and moves as though manipulating her body from the outside. I would bet my complete DVD series collection (deluxe edition) that in casting for the part of Leona Eltridge the ability level of the actress likely was not even a consideration. This would have been problematic had she been a regular character like Dr. Lang who would be having considerable influence on the direction of the main storyline. But the character only has two episodes and is merely a bridge to the introduction of the Eve character; so, what the hell, at least she’s easy on the eyes, and we may as well just enjoy the view from the “bridge” as we’re crossing it. I suppose I’m surprised that it’s that hard to find a competent actress. especially, as you say, for a bit part.I recall Danny’s post about all the working actors in New York and how DS wound up with Addison Powell. Many people for instance, cast and fans alike, found Roger Davis annoying, yet Curtis liked him so much that he had him come back after his first character was through and started the show’s repertory tradition of actors taking on multiple characters, that is, beyond the 1795 storyline. My definitely minority opinion is that fans might have trouble separating their personal issues with Roger Davis the actor from his actual performance. He is a stronger actor than a lot of his colleagues (e.g. Don Briscoe who could be inconsistent, but perhaps for personal reasons of his own). I think perhaps he might have been too good at being unlikable. Aside from Peter Bradford, he never played a character the audience is suppose to like. All the rest were antagonists (Ned Stuart, Charles Delaware Tate). I guess I put the day players on a different level than the regulars, so when their acting is questionable it doesn’t annoy me as much as a Roger Davis. And good or bad, Fitz left an impression so I guess that’s pretty good for someone who’s only in one or two episodes. This has been a long haul, for sure. But, I’ve always felt that after Eve was introduced the plot started to move again. Marie Wallace is great and the last 8 weeks was pretty fun, especially the Angelique and Barnabas stuff. I mean the the coming 8 weeks worth of story is fun, of course. Did they ever mention how the f*!k Nicholas brought this woman back from the grave! Was there any reference to a ceremony that the audience was simply not privy to (like the Joe and Maggie TOP SECRET memory wipe). You can only use the rabbit out the hat trick so many times before it really begins to grate on the audience’s nerves. Thrills and lack of any type of explanation for said thrills don’t always have to go hand in hand. Yeah, in the previous episode, Nicholas used Carolyn in a summoning ritual to make Danielle appear. Carolyn was basically the bait — Danielle appeared because she wanted to murder Carolyn, but Nicholas had her in a protective circle. It’s still necrobabble, of course, but we did see the summoning. Also: The Maggie memory wipe doesn’t bother me at all, because we’ve already seen hypnotism lots of times, with Maggie, Vicki and Jeff. We can easily fill in that blank. The one that’s really mysterious is Nicholas bringing Angelique back as a vampire. So far, we’ve seen three people become vampires, each in a totally different way. Barnabas was cursed and bitten by a bat, Tom was bitten by Angelique, and Angelique… just happened. Somehow. But that doesn’t really bother the audience much, because making Angelique a vampire is such an appealing idea that we don’t really care how they got there. I didn’t mind the memory wipe, either. It’s also a power we’ve seen Nicholas demonstrate, so there was no need to see him do it, and the reveal scene with Barnabas, Willie, and Maggie worked better, as a result. Angelique as a vampire is not only an appealing idea but it’s wonderful poetic justice, so we don’t get hung up on the “how.” It’s also not a narrative cheat or storyline killer — bringing Carolyn back to life was both, and a true reset button with no consequences. Bringing Danielle back to life for the experiment bugs me not because it’s outside the realm of Nicholas’s powers (it’s not — Angelique was quite dead in 1795 and came back) but because it removed any consequence from creating Eve. And it’s a lost opportunity if someone had to really face death or actually die. It also seems to conflict with the Devil’s (arbitrary) insistence that Nicholas not use magic to bring Eve back to life after she’s killed. Why can’t he do this? We’ve seen him do it before. It’s never made clear why that matters to the Devil. And, as I have commented before, this whole plot is ridiculously convoluted because Nicholas insists on working behind the scenes with Adam as his pawn. It gains him nothing, as I can see. Barnabas can’t expose him with exposing himself, so why not just work with him directly? It would save a lot of time, especially given the ordeal over the life force. I didn’t see how Nicholas was using Adam and for what means. Nicholas came in hexing everybody at one time and I didn’t see how he brought Eve into the situation and then she refused to be cooperative with Adam. I do like that he put Angelique in her place, and as you said it was refreshing to see Angelique be smacked into something. But then he still used her to get to Maggie. Both Satans of the earth. Well at least for the first time Barnabas seems to be annoyed at the whole thing. This woman showing up at the door claiming to be somebody from somewhere. Just can’t quite figure out what the hell is going on at the moment…lol. I guess sometimes it seems as if you miss even one episode you’re in the dark – I can imagine what it was like back when we didn’t have the luxury of watching at our leisure – I’ll have to go back and re-watch the episodes to jog my memory. Somehow anything to do with Angelique seems OK – she’s just that type of character that you can’t dislike – part of it seems to be the quiet dignified demeanor of Lara Parker – a classy lady all the way. Yeah, for sure — sometimes, the storylines follow their own dream-logic, so it’s easy to forget exactly what happened when. As I’ve been going through this episode-by-episode journey, I’m finding lots of places where I thought things happened in the same episode when they were actually a week apart, especially in 1795. You have to love an anagram. I wonder if I’m the only Dark Shadows fan who thinks Leona is hot because she looks like a dude in drag. When she’s lying on Josette’s bed and thinking about killing all of these people, all of them, she’s so adorable. If I can remember the password to my old Tripod account I will create a webpage in her honor. Leona will be my Craig Slocum. I always assumed they hired someone to read lines woodenly. I attributed it to a side effect of her resurrection. But that’s just my retcon. She probably just was the most available actress at the moment. She’s been through a table read, a run through, blocking, and dress rehearsal before this moment. If she was simply that bad, somebody would have corrected her, and I think she was directed this way. How would the most evil woman who ever lived, act if she came alive after centuries dead, and in modern dress, makeup, and hair? She certainly doesn’t want to arouse suspicion, and being Roget, doesn’t know HOW to be normal. But she has a plan. I never get tired of this performance, weird as it is, and as strangely hot as she is, with the overconfidence and the stare-downs. Bizarro Carolyn the understudy did bizarre stare-downs. But I wasn’t compelled to watch her multiple times……Vicki as well. The ferocious stare-downs that Maggie does in the mausoleum with Willie are gold. But Marie Wallace brings the fire. So, you see, I love Leona for a variety of reasons. All of them quite valid. Didn’t Stokes hear Lang’s tape-recorded message about Adam? Oh my goodness, Erica Fitz’ performance is one of the funniest things I’ve EVER seen. Her delivery of her lines is uncannily similar to that of the legendary Edith Massey (she made her acting debut in John Waters’ Multiple Maniacs in 1969, so who knows, perhaps she saw this episode of Dark Shadows and Ms Fitz had a lasting influence on her). Heh….heh…I loved this moment for a few perverse (but still valid) reasons. I must confess to staring at this “lady” and wondering if she was actually supposed to be a cross-dressing male. No, couldn’t be possible, this was 1968. It was daytime tv. But still…. Barnabas seemed to really perk up as soon as she appeared. Also pretty damn funny: Stokes going upstairs to get the “real” story, and just agreeing to everything Leona said.